There are many disadvantages to moving around a lot. Believe me, I would know. I moved from Ukraine to the US at the age of 21, left behind all friends and family and all of my social support. I moved to North Carolina to do my Master’s and had to start all over. After two years there, right when a friend circle started forming, I moved to Pennsylvania to pursue my PhD. Again, I didn’t know anyone and felt alone. Just when things go good there (I made friends, met my now husband), it was time to move again – this time to Georgia for work. The toughness of starting again was compounded by missing my husband; plus it was hard to make deep connections as I knew I wasn’t going to stay there for long. After two years in Georgia, I finally reunited with my love and moved to Houston, hoping to make Texas my home for a while. It would be nice to stay somewhere for more than two years! Apart from the emotional challenges constant moving poses, there are good things to it. For one, you get much stronger and much more resilient. 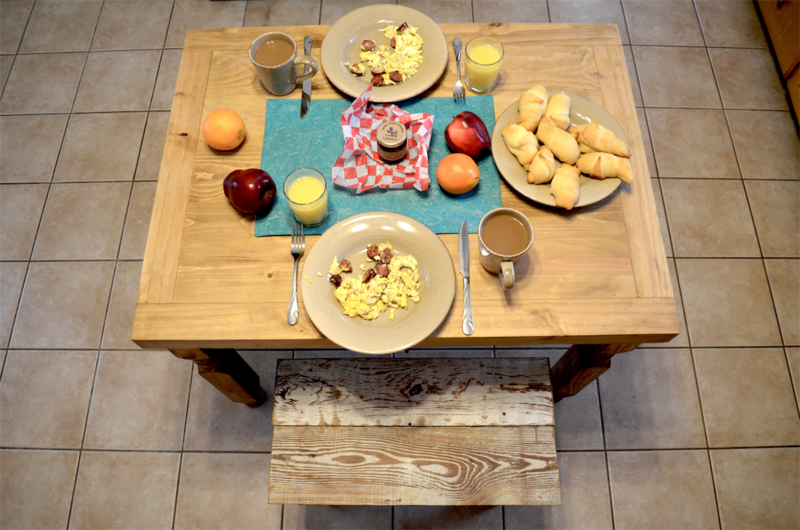 When “starting over” becomes you middle name, and you move to a different part of the country every couple of years – there really isn’t a place you can’t make friends and make yourself comfortable at. And then there’s exploring. Every time I move to a new place I make it a point to explore and get to know my surroundings and the people who live there. And, my favorite part, I try to get to know MY people who live there. And by my people I mean anyone who is from Eastern Europe. Because, once you’re that far from home – anyone who comes from a country that is at least somewhat nearby your won feels like family. I made friends with some really cool people from Russia in North Carolina, reveled in the Ukrainian community of Pennsylvania, and hit it off with some Moldovans and Romanians in Georgia. Ever since I moved to Texas I’ve wanted to explore the state’s Czech heritage. I have heard about the “Texas Czech Belt” but never looked deeper into it. After a little research I found a lot of interesting information and a place where I could start my exploration: Schulenburg, only an hour and a half west of Houston. 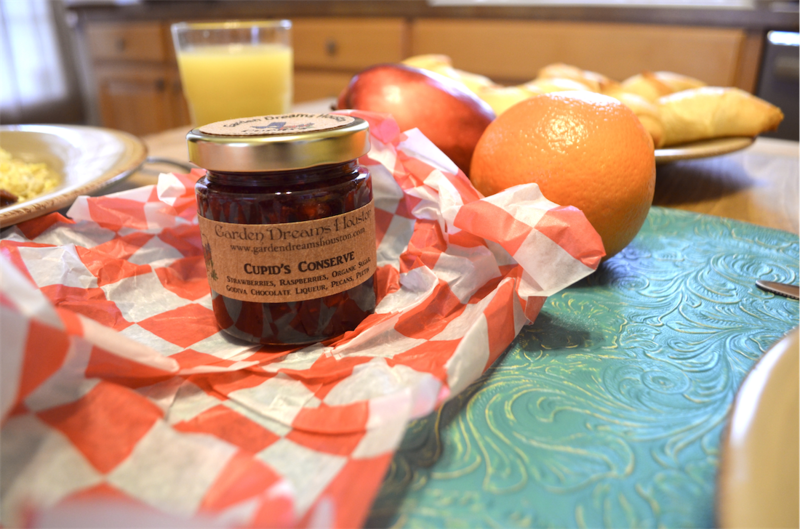 I rented a lovely bed and breakfast for my husband and I, and we set out on a two-day adventure into the Eastern European heart of Texas. Schulenburg is a small town off of I-10 and its few claims to fame are the Sengelmann’s Dance Hall (a restored classic Texas dance hall on Main street) and The Von Minden Hotel – an abandoned structure that once housed a hotel which served as an inspiration for Elvis Presley’s “Heartbreak Hotel”. But we were there for the Czech heritage gems and so we began our exploration at the Schulenburg historic museum. An amazingly equipped museum was completely free to enter and run by the most knowledgeable volunteers I have ever met. 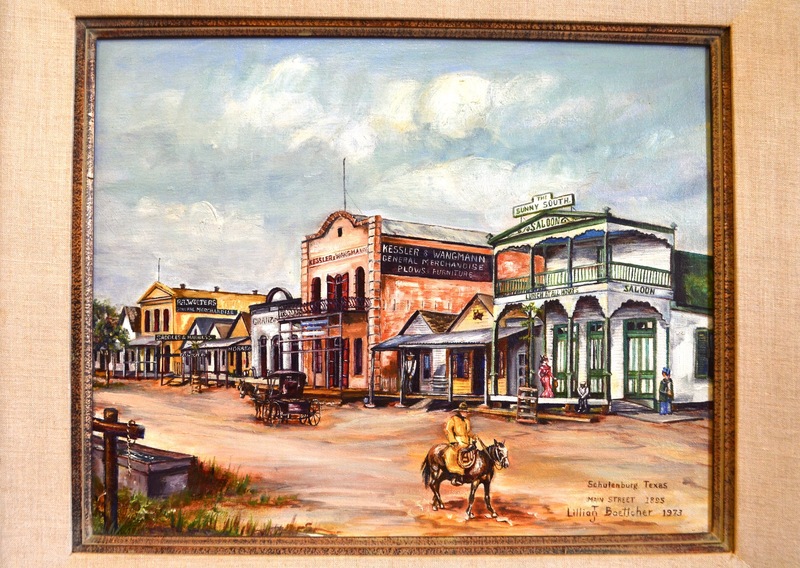 They showed us artifacts from Schulenburg’s past: family photos, turn-of-century clothing and household items, as well as paintings of what the town looked like shortly after its founding. It was amazing to see that most families in the 1920s phone book had German and Czech last names. You’d think you were in a town in the former Austro-Hungarian Empire! Remarkable, many items that the museum had on display were closely familiar to me – as those were the same items my grandparents still used when I was little. I remembered the Singer sewing machine with a pedal, an iron with changeable metal platforms that you had to heat on the stove, a gramophone. It was such a surreal experience to see those same items in a museum in Texas. One of the astonishing stories museum volunteers told us was about dressing. They had some clothing items from early 1900s and told us that, at the time, an average woman’s wardrobe consisted of about 39 items of clothing. How many do we have now? Hundreds? It was mind blowing to see how people, especially immigrants who came from overseas with nothing but one suitcase, got by with so much less than we have today. And I bet you they were happier than our generation is, too. 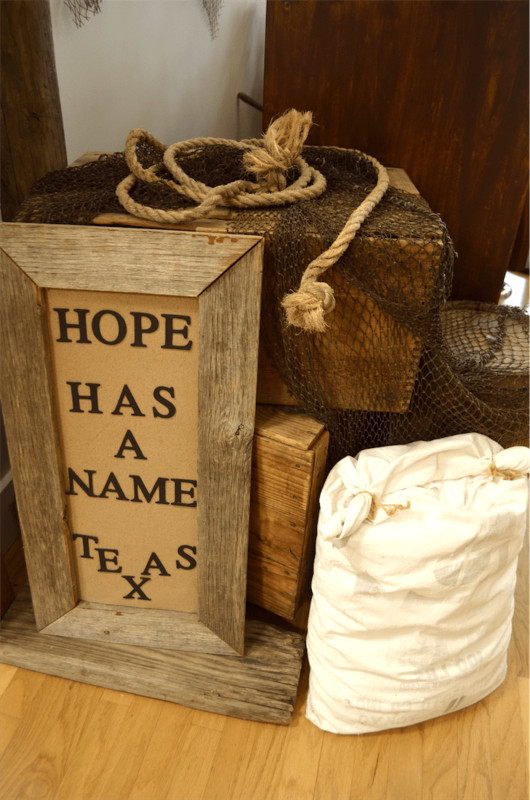 Our next destination took us through High Hill to La Grange, the home of Texas Czech Heritage and Cultural Center. We made sure to stop in High Hill and check out the amazing High Hill painted church. 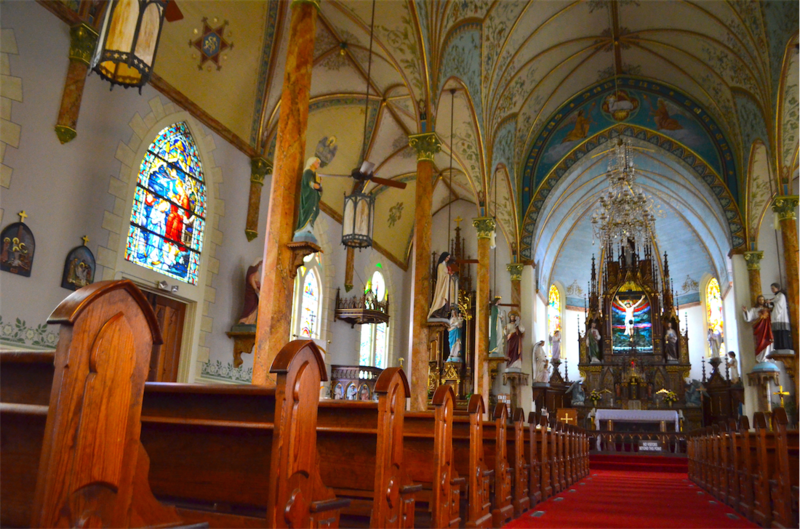 There is an entire collection of these churches in central Texas: unassuming from the outside, these churches astonish you with the opulence of color and décor the moment you step into the door. The unbelievable stained glass windows bear the year of church’s founding (1899) and the names of people who helped raise or donated funds for the church. And again, all names are German and Czech. Once we arrived in La Grange, we got a real treat of being able to visit the Czech Heritage and Cultural Center. The travel guidebook provided the wrong hours of operation, and we got there a few minutes after they officially closed. There were still people in the center, as they were getting ready to celebrate a wedding shower of two young people of Czech origin. We were quite disappointed, but the Center volunteers opened the door for us, invited us in, showed us their welcome video, and gave us a tour of the Center! It melted my heart, to see such hospitality that I know and love so well from being surrounded with Eastern Europeans my whole life. 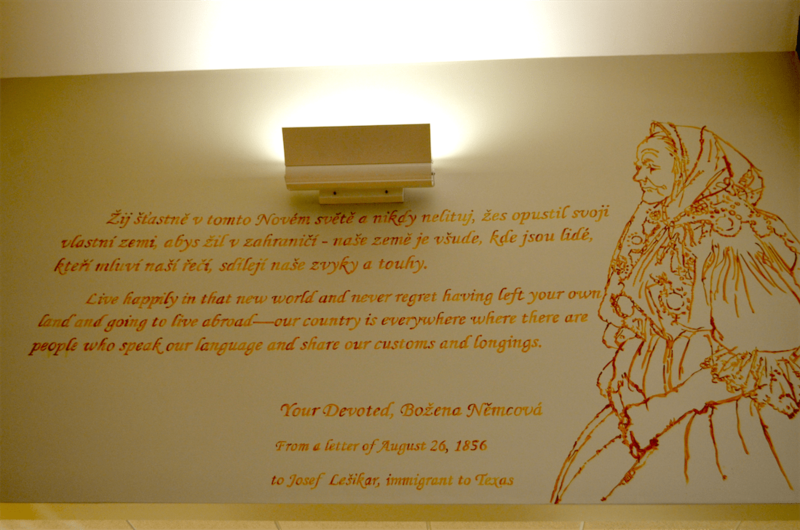 The Center’s library is fill of books and genealogy research on Czech immigrants in Texas, and the gift shop is stocked with cookbooks, Bohemian glass, and painted Easter eggs. What a bittersweet and beautiful sentiment, one every immigrant can relate to.